Cardillac, the legendary goldsmith who was jealously in love with his own creations, the author it was inspired by E.T.A Hoffmann’s literarry figure. Created by Dieter Hofrichter and published by Hoftype, is available in 14 styles, 7 weights (from XLight to Black) and italics, a variety of OpenType features and multi-language support. It is a mix between classical Didonesque elements with new unique details. This elegant font is ideal for magazine & newspaper. 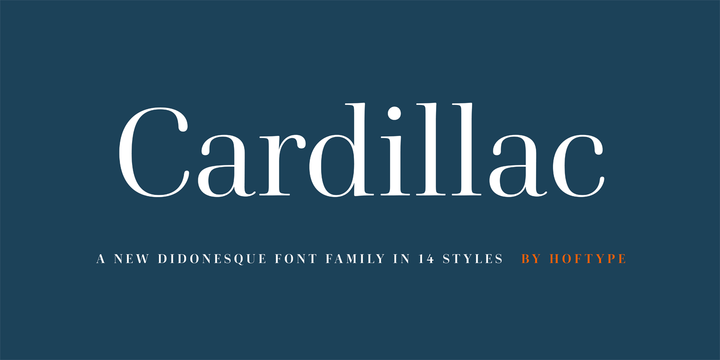 Have fun using Cardillac! Price: starting from $49 for one font to $198 for all 14 fonts. A font description published on Tuesday, June 5th, 2018 in Dieter Hofrichter, Fonts, Hoftype by Alexandra that has 1,951 views.